This chapter explains the origination, evolution, emerging results, and potential long-term impacts of one particularly daunting enterprise transformation effort within the US Department of Defense. It offers a unique case study for a multi-disciplinary endeavor referred to as the project to Transform US Army Supply Chains (TASC Project). The TASC project pursued comprehensive and creative applications using a variety of Operations Research methods, advanced analytics, and management innovation to improve tactical, operational, and strategic decision making for the military's global sustainment enterprise. This chapter may be of interest to those confronting supply chain and other complex enterprise transformation challenges: national security officials; aerospace, defense, and industrial professionals; university graduate students and professors of engineering systems, operations research, and management. 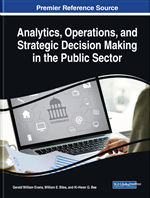 The strategy described herein offers potential solutions broadly applicable to other public institutions and government bureaucracies as well. During late Summer 2002, the Commanding Generals for US Army Aviation and Missile Command (AMCOM) and Army Materiel Command (AMC) initiated an ambitious effort to improve logistics operations in order to better relate resource investment levels to current readiness and future capabilities. Several factors influenced their decision at that time. The GAO “hi-risk list” for federal agencies had cited the Army and Defense Department for poor supply management since 1990. Although budgets were beginning to slowly increase in the aftermath of the post-Cold War drawdown, rapidly growing backorders for parts and nearly a billion dollars of unfunded requirements for aviation spares were causing increasing concern. Nonetheless, their impact on readiness was not at all clear. While aggregate fleet-wide aviation readiness had been slowly declining, expensive weapons systems across the Army were inexplicably being declared non-operational due to lack of relatively cheap parts. Sustainment Readiness Levels (SRLs): SRLs improve combat capabilities and materiel readiness by correcting persisting deficiencies in demand forecasting, inventory policy, and strategic resource planning. Aligned with the TASC project “catalysts for innovation”, SRLs include: mission-based forecasting (MBF), readiness-based sparing (RBS), condition-based maintenance (CBM), intermittent demand, readiness responsive retrograde (R3), sustainment early warning system (SEWS). The TASC project further recommended the Army extend SRLs beyond Class IX to other classes of supply as well. Bullwhip Effect: A system dynamics concept first explored by MIT Professor Jay Forrester in Industrial Dynamics (1961) AU8: The in-text citation &quot;Industrial Dynamics (1961)&quot; is not in the reference list. Please correct the citation, add the reference to the list, or delete the citation. , the effect refers to the amplitude of a whip as it increases down its length: the further from the originating signal, the greater the distortion of the wave pattern. The phenomenon is also applied to supply chain concepts to explain increasing inventory swings in response to customer demand as one moves further up the supply chain. AMCOM: The sustainment function for the US Army is executed by the Army Materiel Command (AMC). The TASC project was initiated by AMC's subordinate aviation and missile command (AMCOM), which then consisted of 12,000 scientists, engineers, program managers, logistics and supply professionals managing a $10 billion annual budget with contracts in excess of $125 billion. Class IX: The US military divides supplies into ten “classes” designated by Roman numerals. For Class IX, consumable repair parts (e.g., bolts, screws, washers, etc.) are procured and distributed to the services by the Defense Logistics Agency. Non-consumable spares, which are components and assemblies for Class VII end items (hence often referred to as “secondary” items), are maintained, repaired, overhauled, and upgraded by the services in their respective repair depots. Depot-Level Reparables: DoD has a broad array of weapon systems and major end items that typically consist of several expensive components. For many of these components, it costs less to replace them with a repaired, refurbished spare than to buy a new one. Maintenance, repair, overhaul, and technology upgrades are performed at various DoD depots, hence the term depot-level reparables (DLRs). DLR inventory accounts for approximately $100 billion of assets. Risk Pooling: The term has traditionally been used to describe the pooling of similar risks that underlies the concept of insurance. Now also an important supply chain management concept, risk pooling reduces variability by aggregating demand across customer locations thereby reducing safety stock and inventory across the enterprise. Sustainment: The US armed services perform functions prescribed in Title 10 (Subtitle B) of the United States Code. For the Department of the Army, these include manning, organizing, training, equipping, and sustaining land combat forces. The sustainment function includes supply, maintenance, and ground transportation. The term also applies to the post-Milestone C phase of the system life cycle, following manufacturing and production.